Maglev (derived from magnetic levitation), is a system of transportation that suspends, guides and propels vehicles, predominantly trains, using magnetic levitation from a very large number of magnets for lift and propulsion. This method has the potential to be faster, quieter and smoother than wheeled mass transit systems. The power needed for levitation is usually not a particularly large percentage of the overall consumption; most of the power used is needed to overcome air drag, as with any other high speed train. The highest recorded speed of a Maglev train is 581 kilometres per hour (361 mph), achieved in Japan in 2003, 6 kilometres per hour (3.7 mph) faster than the conventional TGV speed record. 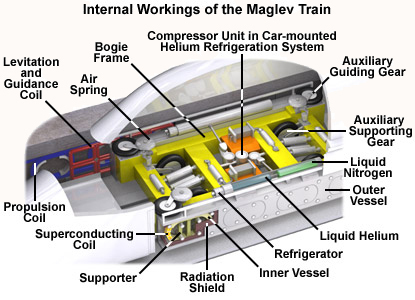 Maglev is a system in which the vehicle runs levitated from the guideway (corresponding to the rail tracks of conventional railways) by using electromagnetic forces between superconducting magnets on board the vehicle and coils on the ground. The following is a general explanation of the principle of Maglev. The “8” figured levitation coils are installed on the sidewalls of the guideway. When the on-board superconducting magnets pass at a high speed about several centimeters below the center of these coils, an electric current is induced within the coils, which then act as electromagnets temporarily. As a result, there are forces which push the superconducting magnet upwards and ones which pull them upwards simultaneously, thereby levitating the Maglev vehicle. The levitation coils facing each other are connected under the guideway, constituting a loop. When a running Maglev vehicle, that is a superconducting magnet, displaces laterally, an electric current is induced in the loop, resulting in a repulsive force acting on the levitation coils of the side near the car and an attractive force acting on the levitation coils of the side farther apart from the car. Thus, a running car is always located at the center of the guideway. A repulsive force and an attractive force induced between the magnets are used to propel the vehicle (superconducting magnet). The propulsion coils located on the sidewalls on both sides of the guideway are energized by a three-phase alternating current from a substation, creating a shifting magnetic field on the guideway. The on-board superconducting magnets are attracted and pushed by the shifting field, propelling the Maglev vehicle. The commercial automated “Urban Maglev” system commenced operation in March 2005 in Aichi, Japan. This is the nine-station 8.9 km long Tobu-kyuryo Line, otherwise known as the Linimo. The line has a minimum operating radius of 75 m and a maximum gradient of 6%. 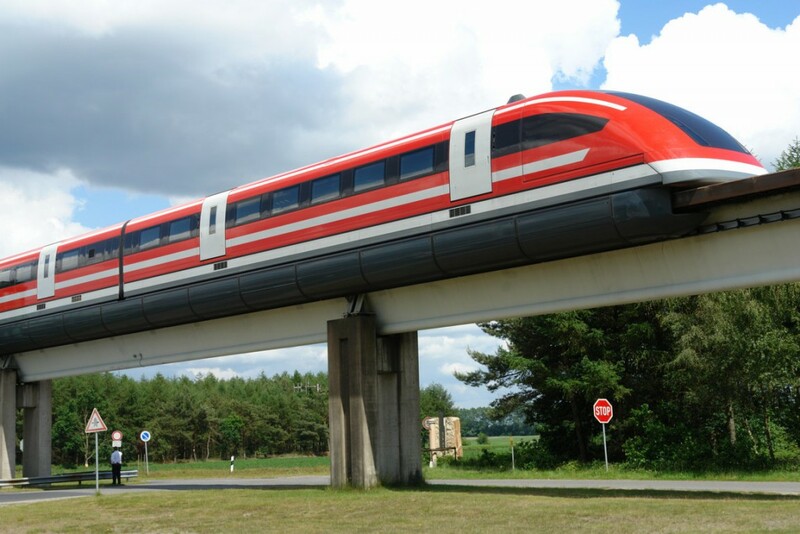 The linear-motor magnetic-levitated train has a top speed of 100 kilometres per hour (62 mph). The line serves the local community as well as the Expo 2005 fair site. The trains were designed by the Chubu HSST Development Corporation, which also operates a test track in Nagoya. Transrapid, in Germany, constructed the first operational high-speed conventional maglev railway in the world, the Shanghai Maglev Train from downtown Shanghai (Shanghai Metro) to the Pudong International Airport.It was inaugurated in 2002. The highest speed achieved on the Shanghai track has been 501 km/h (311 mph), over a track length of 30 km. Despite the speeds, the maglev has been criticised as having few stops and a questionable commercial success. Construction of an extension to Hangzhou was planned to be finished in 2010, but has been postponed in favour of a conventional high speed railway running at 350 km/h. The Shanghai municipal government was considering building the maglev line extension underground to allay the public’s fears of electromagnetic pollution;this same report states that the final decision has to be approved by the National Development and Reform Commission. The first maglev utilizing electromagnetic suspension opened to public was HML-03, which was made by Hyundai Heavy Industries, for Daejeon Expo in 1993 after five years of research and manufacturing two prototypes; HML-01 and HML-02. 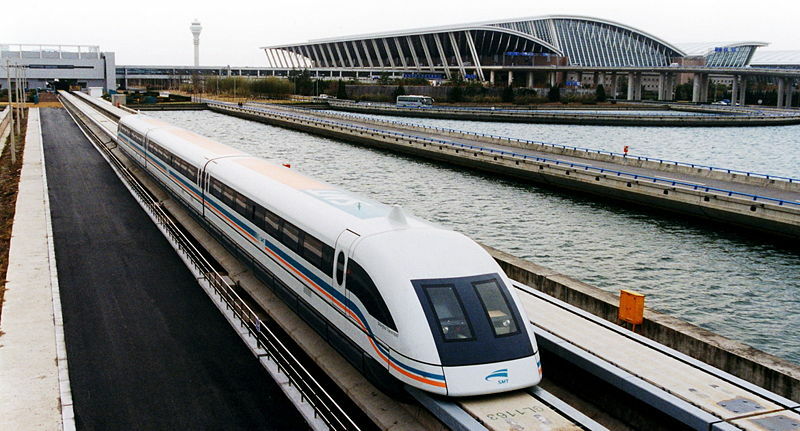 Research for urban maglev using electromagnetic suspension began in 1994 by the government.The first urban maglev opened to public was UTM-02 in Daejeon on 21 April 2008 after 14 years of development and building one prototype; UTM-01. The urban maglev runs on 1 km track between Expo Park and National Science Museum.Meanwhile UTM-02 remarked an innovation by conducting the world’s first ever maglev simulation.However UTM-02 is still the second prototype of a final model. The final UTM model of Rotem’s urban maglev, UTM-03, is scheduled to debut at the end of 2012 in Incheon’s Yeongjong island where Incheon International Airport is located. There have been two incidents involving fires. The Japanese test train in Miyazaki, MLU002, was completely consumed in a fire in 1991.As a result of the fire, political opposition in Japan claimed maglev was a waste of public money. On 11 August 2006, a fire broke out on the Shanghai commercial Transrapid, shortly after leaving the terminal in Longyang; nobody was injured. The cause is believed to be a fault with the Maglev’s electrical system,it has been suggested to have been an onboard battery unit. On 22 September 2006, a Transrapid train collided with a maintenance vehicle on a test/publicity run in Lathen (Lower Saxony / north-western Germany). Twenty-three people were killed and ten were injured; these were the first fatalities resulting from an accident on a Maglev system. The accident was caused by human error; charges were brought against three Transrapid employees after a year-long investigation.